Be the first to share your favorite memory, photo or story of Alene. This memorial page is dedicated for family, friends and future generations to celebrate the life of their loved one. 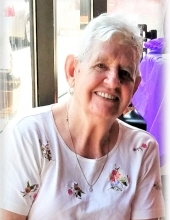 Alene Heatwole, age 82 of Williamsburg, KY passed away Tuesday September 11, 2018 at her home. She was born June 27, 1936 in Wofford, KY to the late Fred Barker and Stella Rains Barker. Along with her parents she was preceded in death by her husband James Heatwole, 3 Sisters: June Holt, Thelma Ball and Lena Taylor and 1 Brother: George Barker. She is survived by her daughter Denise Willmore of Williamsburg, 2 Grandsons: John Madon and Austin Willmore of Williamsburg, 1 Sister Faye Douglas of Williamsburg, special family member Glen Willmore of Williamsburg, 7 nephews: Harold Lynn Douglas (Debbie), Joshua Douglas, Gavin Douglas, Jerry, Joe, Mike and Steve Caddell, 1 Niece: Donna Douglas, several great nieces, great nephews and a host of relatives and friends to mourn her passing. Funeral service will be 2:00pm Saturday September 15, 2018 at Ellison Funeral Home Chapel with Bro. Bill Mitchell officiating. Interment will be in the Cumberland Freewill Cemetery. Visitation will be from 11:00am until the funeral hour at the funeral home. To send flowers or a remembrance gift to the family of Alene Heatwole, please visit our Tribute Store. "Email Address" would like to share the life celebration of Alene Heatwole. Click on the "link" to go to share a favorite memory or leave a condolence message for the family.